Green fashionistas & eco parents will revel in this week’s giveaway, which offers a chance to dress your baby or tot in adorable designer organic clothing from baby star valued at $64! 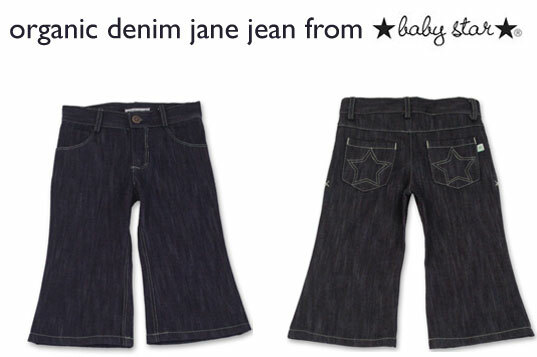 One lucky winner will choose between a pair of either organic denim jane jeans or organic denim jack jeans AND either a sweet and frilly soy organic stella skirt or the super soft and stylish soy organic johnny pant — depending on whether you’ll be outfitting a fashion forward little girl or a green hipster little boy! Sizes for the stella skirt and johnny pant range from 6-12 months up to 4T and the organic jack and jane jeans come in sizes 6-12 months to 6T — so babies, toddlers and kids alike can all reap the rewards of these sustainable styles! baby star was founded by a husband and wife team who began to design clothing after the birth of their first child, with the purpose of making their little star shine. They developed products that “blended cool, hip designs with ultra soft textures” and they strive to create “essential items for both baby and parent in a clean, simple and modern way,” while making them safe for children and the environment. Enter to win after the jump! ENTER TO WIN DESIGNER ORGANIC BABY STAR CLOTHING! 1) Sign up for our weekly newsletter (if you haven’t already!) We’ll be notifying the winner in our newsletter – so you need to sign up and receive next week’s newsletter to find out if you have won either the organic denim jack jean or the organic denim jane jean AND either the soy organic stella skirt or the soy organic johnny pant! 2) Add a comment to this post with your answer to the following question: Why is dressing your baby or tot in organic clothing important to you? Contest ends Sunday, April 4, 2010 at 12 midnight EST. Winner will be announced in next week’s newsletter! I breast feed, organic cloth diaper, and only feed him organic food - shouldn't everything he wears follow suit? Even if she doesn't understand, all the measures we take will matter for her future. A lesson in the long range consequences of what we do now. She'll get the "sustainability" talk when she's old enough. I am very conscious of the environment and doing what I can to protect the world my children grow up in. Working with sustainable architecture it only makes sense to consider organic alternatives for the most important part of our future...our children. Whether she understands or not, all the choices we make are for her future. It's a lesson in the long-term effects of our actions now. We'll give her the "sustainability" talk when she's older and point out how much she's done already. Before our son was born we commited to making a better life for him and his generation rather than adding to the destruction of his future. Supporting organic is a huge part of that for us. Thank you to companies like Baby Star for making it possible for parents. I want my baby to wear organic clothing because it's important to me that our family supports sustainable practices as much as possible. I cringe to think of all the chemicals and dyes and processing that go into making clothing, so choosing organic when possible makes one feel better about consuming (I just can't not buy some things, of course). Making small choices can really add up in the long run, and preserve the earth for the little ones who are wearing these clothes. We eat organic as much as we can, our bedroom is organic only, my husband builds green, non-toxic furniture, we practiced elimination communication and used cloth-diaper part-time. We do all that, and some more, to maintain a better health and also for the environment of course. Organic cotton is important to me, as traditional cotton production is polluting. I also prefer my baby to wear organic clothing with non-toxic dyes, I feel it is safer for her health. Thanks for this contest! We use organic clothing for our little boy because we find it's one of the things that helps us keep his eczema in control. Other types of clothing seems to aggravate his condition. having organic cotton clothes for our child just alleviates one less thing we have to worry about, since we know it will be chemical free and sustainable. Chemicals are so toxic. My son is allergic to dyes, preservatives, bleaching agents, etc. cloth is processed so harshly that buying organic takes out some of those chemicals. Who needs a rashy kid!! My son is the sweetest thing on earth and he deserves only the best that the earth has to offer! Organic is great because it's good for the planet, and I don't have to worry about my little one being covered in toxic nasties. Organic works better for sensitive skin! It's important to me because our skin is our largest organ and having my girls wear organic clothing is the best way to protect them from any harsh chemicals in clothing. I love dressing my son in organic clothing because it is so soft and I know the fabric won't irritate his sensitive skin. Dressing my son in organic clothing is important to me because I want him to understand how important our choices are as consumers in order to try to make a change towards more environmentally friendly practices. When clothes are orgnic there's one less thing for me to worry about. I love my daughter so much and she deserves the best and she deserves for the earth/world to be the best so she can enjoy it!! 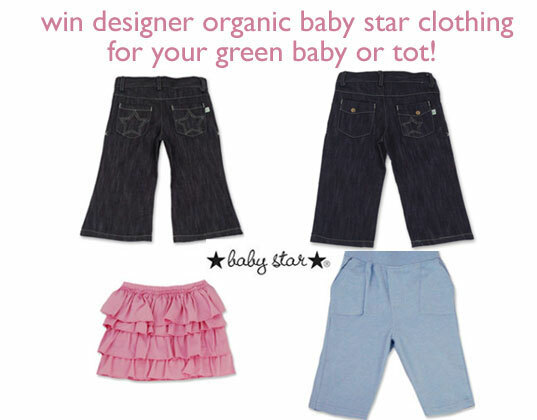 Win Designer Organic Clothing from baby star! Green fashionistas & eco parents will revel in this week's giveaway, which offers a chance to dress your baby or tot in adorable designer organic clothing from baby star valued at $64! One lucky winner will choose between a pair of either organic denim jane jeans or organic denim jack jeans AND either a sweet and frilly soy organic stella skirt or the super soft and stylish soy organic johnny pant -- depending on whether you'll be outfitting a fashion forward little girl or a green hipster little boy! 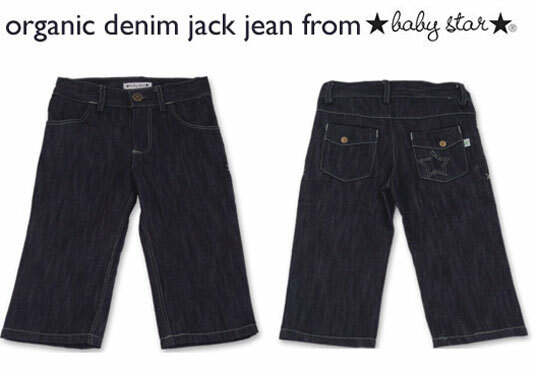 Sizes for the stella skirt and johnny pant range from 6-12 months up to 4T and the organic jack and jane jeans come in sizes 6-12 months to 6T -- so babies, toddlers and kids alike can all reap the rewards of these sustainable styles!